Tell The Task Force, its time to #CancelPinkwashing! What’s Going on at the Task Force? This year, The Task Force rejected all sessions related to Palestine/Israel and pinkwashing at Creating Change and put Israel advocates at the lead for all Jewish programming at the conference. Beyond Creating Change , the Task Force has further indicated its alignment with Israel by partnering with the Israeli-based circuit party Forever Tel Aviv at its annual Winter Party Festival in March. 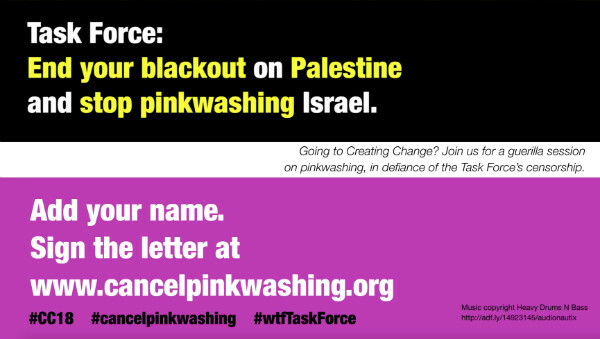 In response, we are asking people to sign and share a letter demanding that the Task Force end its blackout on Palestine and stop pinkwashing Israel. Sign Below! The Task Force must make a choice. Now is the time for powerful LGBTQ organizations in the US to be resolute and clear on immigration, policing, colonization, and war. While claiming "neutrality," the Task Force has actually taken action against queer and trans activists working on racial justice and Palestinian liberation while simultaneously working more closely with Israel-advocacy organizations. 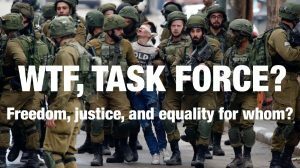 This year, The Task Force rejected all sessions related to Palestine/Israel and pinkwashing at Creating Change and put Israel advocates at the lead for all Jewish programming at the conference. Beyond Creating Change, the Task Force has further indicated its alignment with Israel by partnering with the Israeli-based circuit party Forever Tel Aviv at its annual Winter Party Festival in March. There is no such thing as neutrality when it comes to basic rights and freedom for all people. This includes the rights and freedom of Palestinian people, including LGBTQ Palestinian people. 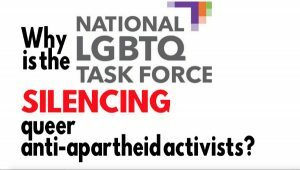 We demand that the Task Force reverse course and commit to providing time and space for workshops focused on queer and trans decolonization work that includes queer and trans Palestinian liberation at next year’s conference, cancel its fundraiser with Forever Tel Aviv, and take a firm stand against pinkwashing in the US and Israel and commit to honoring the call for boycott of Israeli institutions. 1. 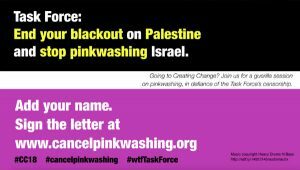 Lift the informal ban on Palestine and stop pinkwashing Israeli apartheid. Commit to honoring the call for boycott, divestment and sanctions (BDS) of Israel and Israeli institutions. 2. 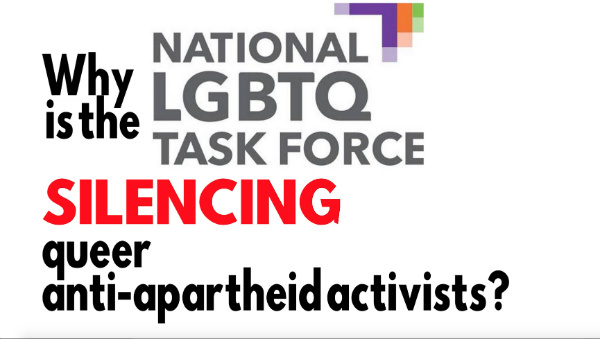 Publicly apologize to the queer and trans Muslim, Jewish, and MENA/SWANA communities, particularly queer and trans Palestinians, for the Task Force’s role in deliberately silencing and censoring these communities and their organizing. 3. Commit to providing time and space for workshops focused on queer and trans decolonization work that includes queer and trans Palestinian liberation. 4. Commit to providing time and space for Jewish and Muslim faith programming that is equal to the time provided for Christian faith programming.